My family LOVES fried chicken. I don’t make it often because, well, it’s fried. But when I do make it, my husband and kids gobble it up. I like to make extra so we have leftovers for a fried chicken salad for lunches. With two growing boys, there are rarely leftovers! This glaze recipe is from The Pirate’s House in Savannah, Georgia. If you’ve never been to the Pirate’s House Restaurant, you don’t know what you are missing! The building is rich in history and is a favorite dining establishment of locals and tourists alike. There are 23 rooms for dining each with its own charming decor. When I make this glaze, I use my Grandmother’s fried chicken recipe. You can use any favorite fried chicken recipe. Just about everyone has one! It’s a tad on the sweet side but is a nice change from just fried chicken. You can certainly serve it on the side if you don’t want to ladle over the chicken. My son likes to dip his chicken so I put it in a cup on his plate. The second time I made this I let it simmer too long because my chicken was not quite done. It got very hard, almost candy-like. So, lesson learned, follow the recipe for the simmering time! This recipe is unbelievably easy. There are only 3 ingredients and as long as you follow the timing directions, the recipe will be perfect. This recipe will make enough for 4 servings, it is easily halved or doubled depending on how many friends you’re serving. Enjoy! Melt butter over low heat. Whisk in honey until well blended. Bring to a simmer and add pecans. Simmer 15 to 20 minutes, stirring occasionally. Ladle over hot fried chicken. 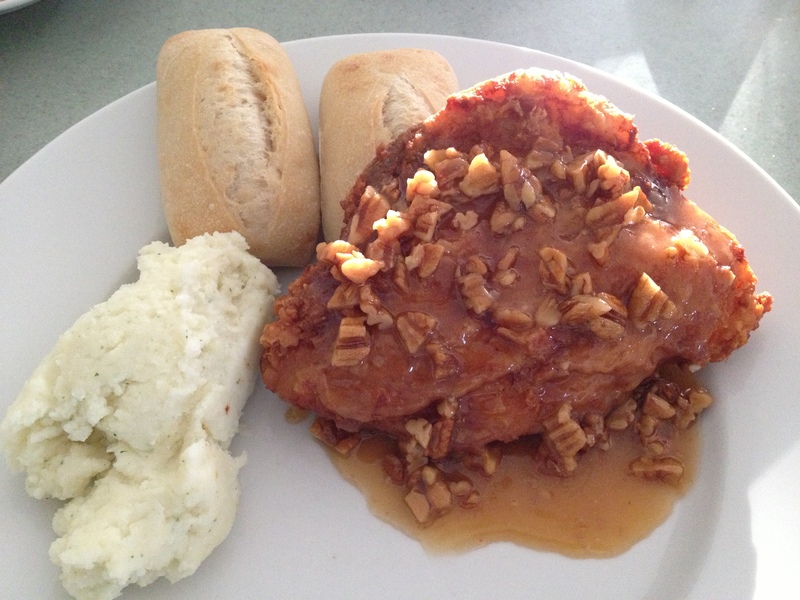 This entry was posted in Chicken, Comfort Food, Company Worthy and tagged fried chicken, glaze for chicken, honey glaze, pecan glaze, Savannah, The Pirate's House. Bookmark the permalink. Ellen Folkman: I totally love your blog and subscribed to the daily emails. I cannot wait to try these pecan-honey glaze recipes. Beautiful selection of superb recipes.